Okay we are back from the delays and non posts! Again sorry to interrupt the regular system but we should be sorted now. First things first.. for any AFL fans - especially cats ones, well it wasn't our year. Some good success and some frustratingly disappointing lows which was capped off by the weekends poor first quarter showing to the swans who eliminated Geelong's chance for glory in next weeks grand finals. There's always next year though! Telestrations 12 Player Party Pack: So I've played this before but now officially own it. First play of my own version of telestrations and it went down a treat with a group comprised of mostly light gamers and first timers. Lots of laughs, random sketches and horrible guesses contributed to a good night. We did keep score but just all personally gave out 'best picture' and 'best guess' awards to make people feel special about themselves and well try a bit harder to be a little more clever in each aspect. Pandemic Legacy: ***SPOLIERS*** The second half of December, also known as the end of the game, end of the legacy and end of our adventure which started way back on Feb 29th. There was some nerves coming into the last game that a loss would have been a waste of how ever many nights we spent playing, but after we knew we were going to lose last week everything we did was to set up and make this week a success. Ultimately it was. We won by what felt relatively easily and finished our Legacy with 17 games played and a lowish score of 543 points which was greatly let down bravo team coming in to help with one task left to go. Good fun and I'll post a review in the next couple of weeks. Elder Sign: Never actually played a solo game before but after reading about how many people play Elder Sign solo, I decided to give it a go. I'll be honest.. I didn't finish. It feels a bit strange to me as I'm not used to it but the whole fun of board games to me is to share the experience with someone else. So as Amanda Sharpe I started my quest to stop Hastur and well to be honest it felt like Hastur wasn't going to have a chance and I decided to stop and wait for someone else to play with. Nice to go through the game first however as it should make it a lot easier to teach now. Telestrations 12 Player Party Pack - As briefly mentioned above I've played this before but only recently was able to find somewhere that I could purchase it from in Australia. I decided to go the upgraded edition which just adds enough boards and markers (as well as a few new cards) to make it a 12 player game. The more the merrier - this sits nicely for those nights where most of the group wouldn't normally play board games. Elder Sign - Cthulu is a word I actually don't know how to pronounce. I'm new to the lore and the world of H.P. Lovecraft but it seems massive so its gotta be good? Mansions of Madness was a total impulse buy and I only bought it because of a 40% off sale not really even realising what I was getting myself into. Elder Sign however was a planned purchase after 'investigating' a little it seemed to be the best 'gateway' to Cthulu and the ancient ones being on the simpler end of the spectrum. I like dice games and figured this would be a good starting point for our group before dropping Mansions on them. Fury Of Dracula - Here's a game that wasn't even on my radar. Yes I had heard about it, seen pictures and read the basics - but I wasn't fussed for whatever reason. 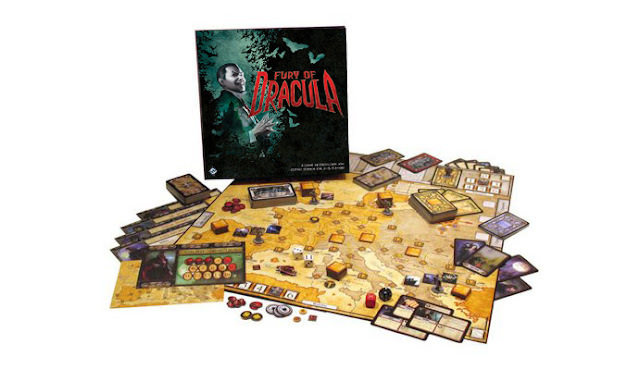 Nothing wrong with a vampire theme and may as well be about Dracula the most famous and powerful vampire of them all, but the length of the game was a bit much to see this get a lot of table action and I didn't know enough about Fury Of Dracula to give it a second thought. Until the announcement that Fantasy Flight games and Games Workshop were splitting and a select range of games previously released would all be going out of print. Suddenly there was a bit of panic. What if I decided down the track that I wanted Fury Of Dracula? How much would I have to pay on EBAY for a copy? Would I regret not buying it when I had the chance? Well now I'll never know because I bought it. And, I don't regret the purchase one bit! After reading the rules and working out how the game actually plays, I'm excited to get it to the table and try it! I've got a night already planned for five which can't come soon enough, but unfortunately isn't until October 21st. Expect to hear more then..